Two weeks ago I visited Long Beach, California, attending a conference called Mathematical and Computational Issues in the Geosciences, organized by the Society of Industrial and Applied Mathematicians. I wanted to exercise my cross-thinking skills. As expected, the week was very educational for me. Well, some of it was. Some of it was like being beaten about the head with a big bag of math. Anyone for quasi-monotone advection? What about semi-implicit, semi-Lagrangian, P-adaptive discontinuous Galerkin methods then? Notwithstanding my apparent learning disability, I heard about some fascinating new things. Here are three highlights. Image courtesy Taras GeryaProf Gerya is a very animated and lively presenter. There were three great things about his talk: he explained the point of his research; he explained his methods in terms I could understand; he had some very, very cool visualizations. Gerya uses finite difference with marker-in-cell methods as a sort of rough-and-ready numerical modelling approach. The result is improved speed, with an acceptable penalty in accuracy. He also regards modelling not so much as a quantitative tool, but more as a way to train our intuition. 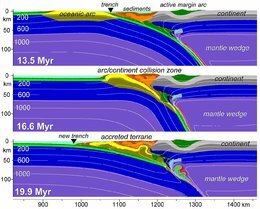 Our intuitive powers are weak, he points out, when we are thinking about scales in time or space that are outside the human realm: more than 1 km or 100 years, or less than 1 mm or 1 s.
The result: beautiful animations of subducting slabs, spreading ridges, and bolide impacts. He says his recent foray into planetary geology is just the latest in a string of career adjustments, and helps drive him to keep improving his modeling code. To find out more, and get his MATLAB codes, check out Gerya's blog here. This young researcher is working on extending some methods for better imaging of multiples. He was one of the few mathematicians brave enough to forego the comfort of formal theorems and equations and opt instead for plain language physical description. He even explained why the problem was an interesting and relevant one! As I've written before, I think using energy traditionally dismissed as noise, like multiples, to increase signal instead is one of the unsolved problems in exploration geophysics. 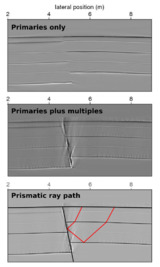 Perhaps not for long, though, because Alan and his supervisor, Alison Malcolm, have applied some straightforward algorithms to building a conventional seismic image from multiple reflections. Such reflections might be the prismatic reflections from a fault (shown here), or the reflections from the bottom of a horizontal salt layer. They are relatively easy to discriminate from primary reflections because the wavefronts have long travel time (suggesting reflections from great depth), but are moving relatively slowly (like shallow reflections). There were quite a few talks about building 3-D geocellular models, either static models for distributing rock properties like porosity and permeability, or dynamic models for predicting fluid flow during production. Many people were discussing the finer points of, for example, fault representation: should they be stair-stepped, or perhaps we need curved cell boundaries? My own opinion is that this kind of incremental advance buys us spurious precision: we simply don't know enough about the subsurface to warrant this degree of representation. If we have spare mathematicians, or more compute power, or just want better answers, better to tackle the real unsolved problem: uncertainty. This is what Stenerud talked about: capturing uncertainty in geomodels. It's early in the process, so he is focusing on simply varying fault position by some amount. But it's an important start, I think, and I award my third non-existent prize to him for not just talking about uncertainty, but doing something about it. I am excited about the power of computational methods, and inspired to learn much more about programming. Recently I have started to believe that if students are graduating in natural science without being able to write a GNU Octave script or simple Python program, having spent computer classes learning about PowerPoint templates and file formats, then the educators among us have failed them. What do you think? I am grateful to Messrs Gerya, Richardson and Stenerud for being so willing to have me write about their work. The images shown belong to them. Any errors of fact or interpretation are all mine.